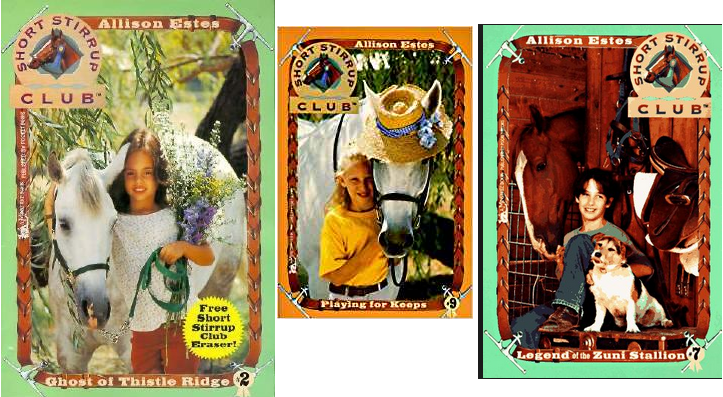 I was casually searching horse book lots/horsey authors I like on eBay, when all of a sudden I stumbled upon a lot for a short kids' pony book series from the 90s called The Short Stirrup Club. Which I had completely, completely forgotten about, having read it sometime between 4th and 6th grade (I think from the library), until I saw a couple of the covers and felt that "staggering backwards in recognition" feeling. The the blonde girl in the hat-wearing-horse cover, her face is super familiar to me too, and I didnt' nab a picture of it here, but the little bay on cover 8 -- I borrowed him for a different sim club too. The other covers don't give me quite as strong an association, but reading through the summaries of all 10, a few of the horse names and plots ring some bells. Megan finds the grave of a young girl exactly her age who lived at Thistle Ridge Farm more than a hundred years ago. Some say her spirit still wanders out to the pasture to visit her beautiful white horse. At first, Megan tries to ignore her fears -- only babies believe in ghosts. But when Amanda and her horse, Prince Charming, suddenly disappear, she doesn't know if she's on the trail of the missing girl or about to come face-to-face with a restless spririt from the past!